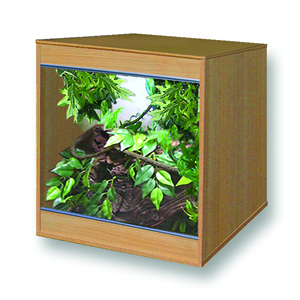 Paul’s Reptile Den offers this modular vivarium as part of the very popular brand of vivariums. 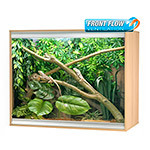 With many features available we are confident this vivarium is more than capable of housing your reptiles and exotic pets. TOUGHENED GLASS: All the glass used in our vivariums is toughened to BS6206A kite marked standards. This toughened glass has up to 5 times its original strength, and if broken, the glass breaks into small blunt fragments. Normal plate glass, if damaged, breaks into sharp long shards. As the glass is used as sliding glass doors it is crucial that only safety glass is used to prevent serious injury. We aim to conform to BS EN 14072:2003 for glass used along with furniture. 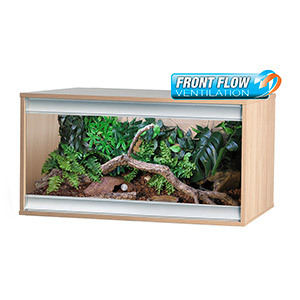 VENTILATION: Each vivarium contains the correct amount of ventilation to provide optimum temperature and humidity levels. 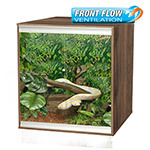 Ø65mm circular vents are positioned at both the top and bottom of the back panel allowing a steady flow of air throughout the vivarium. Each vent contains a plentiful number of holes which are big enough to allow air to flow in and out, but small enough to prevent live foods from escaping. ASSEMBLY: We have improved the self assembly construction. All vivariums have fewer parts and nearly 50% less assembly fittings. This means that assembly should take half the time and go together first time, allowing your snakes, lizards and other reptiles to move into their new home quicker. 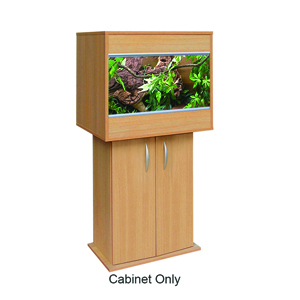 SOLID BACK: We believe that 3mm hardboard is not suitable for a professional vivarium. Its low compression structure and paint or foil surface means a very short product lifespan. This is why we use the same 15mm thick robust wood for all panels. When sealed, our construction lasts many years longer than cheaper competitors. After all our solid back panels are 5 times thicker! CABLE ACCESS: Outlet points have been formed in the edge of the back panel for cable management. Any size of plug or fitting can easily pass through prior to securing the lid. To remove cables or replace, simply loosen the cams and lift the lid. Cable access points are located at each end, along the top. Either point can be easily closed with silicon if not required.